First off, "immigration" is a lie used to justify bigger, more powerful government. Government to be aimed at those the borderists want to aim it at, but bigger, more powerful government, regardless. What was that main theme again? 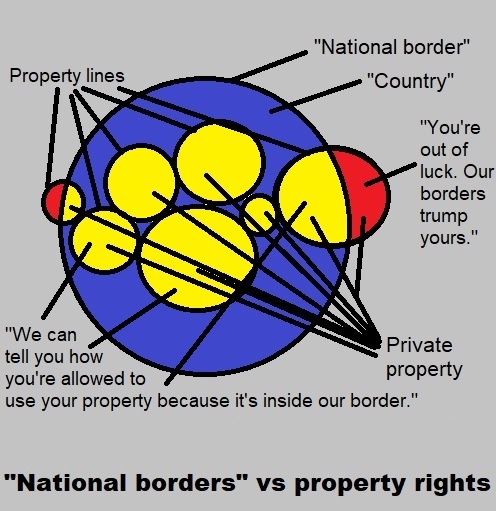 "In a fully privatized libertarian order ... 'public property' ... is the property of domestic tax-payers..."
In a "fully privatized libertarian order" there would be no "taxes" to be paid by anyone, "domestic" or "foreign". If there were "public property", it would be owned by a group which VOLUNTARILY agrees to pay for its purchase and upkeep and allows the public to use the property at its whim. Not financed through theft. Not really "public". And this has absolutely no bearing on the borderist argument, no matter how badly they wish it did. 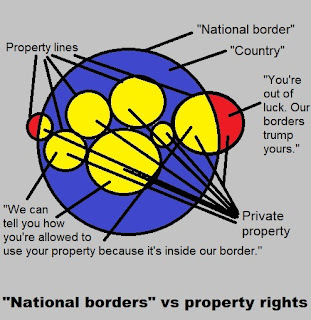 Borderism is anti-property rights, because they believe the State's spurious claim on my property trumps mine. The last 3/5 of the paragraph wobbles between admitting government "border control" is a bad deal for the slaves (and others), and seeking to justify it anyway. This is just one example of where the borderists go wrong; the examples are seemingly endless. And frustrating. All calculated to reach the conclusion that "feels" pragmatic and cozy, while avoiding the truth. The shared/public property position doesn't hold up at whatever point it uses that property to violate, which is from the premise or start of their argument, as a state is systematic violence. You don't have a right to violate just because someone is on your property. A state is the equivalent to buying/stealing several acres of land, building a facility and inviting people to come there for security, then trapping them and making them and their children your slaves, using the profits of the operation to kill neighboring farms and towns. It is akin to animal husbandry or something. Keep them controlled by maintaining and feeding them, exploit them as a food source and a marketable product, use the profits to do something bad. People are like cows living on the state-farm.